Recently the food blogosphere has been swarming with wacky pies created for a monthly event called You Want Pies With That? Each month has a different theme, and the challenge is to create an original pie that somehow plays on that theme. I hardly ever make pies for myself, since I'm more of a cake girl, but it seems like a fun idea, and since it is Pie Season, I've decided to join. This month's theme is Holiday Songs, so I took my inspiration from the Elvis classic "Blue Christmas" and made a Blue(berry) Christmas Pie. But I'll have a blue, blue blue blue Christmas. 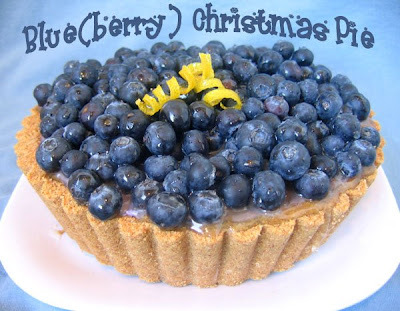 Obviously, with "Blue Christmas" as my inspiration, this pie had to be seriously blue. I decided to make a miniature pie (because there's only...sob...one person to eat it!) with alternating layers of cream cheese ice cream and blueberry ice cream (feeling the cold freeze of loneliness!) and topped by a mound of fresh blue, blue, blue blueberries. I began with a graham cracker crust, made with cinnamon graham crackers. (I think gingersnaps would also be awesome with this pie.) I then made two batches of ice cream--one from cream cheese with just a hint of lemon, and one from fresh blueberries. I mixed a bit of the two together to form a light blue (well, purplish) colored cream so that I had three ice cream bases total. A short while later (ha! ), after all three were churned, I got to work layering my ice creams in the prebaked shell. I had a vision of perfectly even, uniform layers, but that didn't quite work out. The effect was still striking, though, and oh-so-blue. The melting ice cream makes it look like the pie is crying! Poor blue pie. Since this pie took awhile to put together, I had high expectations, and it did not disappoint. 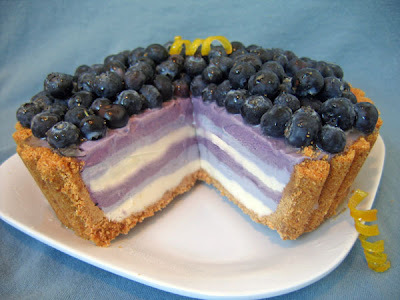 The ice creams turned out beautifully creamy but not too heavy, the lightly spiced crust added a nice crunch while not being too thick, and the juicy blueberries on top added great flavor and cut the richness of the ice cream. Obviously this pie might not fit into some Christmas celebrations, but here in LA it's still beastly hot, so it seemed perfectly seasonal. Place the graham crackers in a food processor with the sugar and process until fine crumbs. Pour into a large bowl and pour the melted butter on top, mixing with your hands until the mixture has the consistency of wet sand and holds its shape when you grip it between your palms. Spray a tart pan with a removable bottom with cooking spray, and press the crust into the pan in a medium-thick layer. Place in a preheated 350 degree oven and bake for 8 minutes, allow to cool completely. Can be made ahead of time. 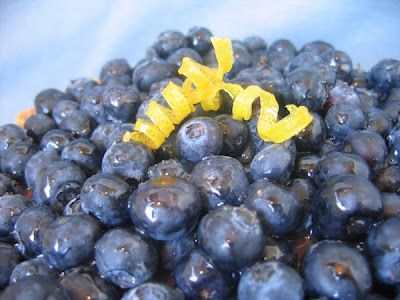 In a saucepan bring blueberries, sugar, and salt to a boil over moderate heat, mashing berries and stirring with a fork. Simmer mixture, stirring frequently, 5 minutes and cool slightly. In a blender purée mixture with milk just until smooth and stir in cream. Pour purée through a sieve into a bowl, pressing on solids with back of a spoon. Chill mixture, covered, at least 2 hours, or until cold, and up to 1 day. Freeze mixture in an ice-cream maker. Transfer ice cream to an airtight container and put in freezer to harden. Ice cream may be made 1 week ahead. Blend cream cheese, milk, lemon juice, sugar, and salt in a blender until smooth. Transfer to a bowl, then stir in cream. Freeze cream cheese mixture in ice cream maker. Transfer to an airtight container and put in freezer to harden, at least 2 hours. Let ice cream soften 5 minutes before serving. You want all of your ice cream to be about the same consistency: soft enough to spread, but firm enough that it won't liquefy and run into all the other layers. I found it easiest to work with ice cream that was freshly made and then stuck in the freezer for about 20-30 minutes. If it seemed too hard, I worked it with my hands for a few seconds to get it soft enough. Basically just spoon a small amount of cream cheese ice cream in the bottom of the prebaked shell and spread it in an even layer with a small offset spatula. If it seems firm enough, you can continue layering on top right away, or freeze it for 10-15 minutes and then repeat the layering until you have reached the top of the shell. I had about 1 cup of ice cream left over, your results may vary with the size of your shell. Freeze until completely solid, at least 3 hours. Top the pie with 2 pints fresh blueberries. If you desire, you can glaze them with an apricot glaze or add fresh or candied lemon zest on top. I LOVE the look of this dessert. (GASP!!!)) It's so . . . blue! So, so, so blue. I love your theme, and I am seriously impressed by the blueness. I bet that this is delicious! Nice theme! You make ice cream making sound like it's a bubble bath! "I made 2 batches of ice cream..."
LOL! I have a phobia of ice cream making ever since mine (by muscles not machine) did not exactly turn out. The pie is BEEYOOTIFUL! I may even want to enter myself!! Wow!!! 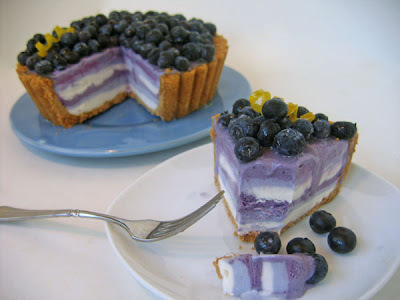 I love blueberries and this pie looks great. Can I have a piece?? WOW how gorgeous is that??? It’s almost to pretty to eat. Gorgeous! Those layers are just incredible! Wonderful job! Holy crap that is freaking awesome! This is amazing! So pretty. You made sooo many different components! Beautiful! WOW...i love the vibrant colors of the layers...it is visually stunning!!!! THIS IS AWESOME!!!!! I am so impressed that you pulled this off! I would never have the patience. Those perfect hues of blue are amazing! An inspired choice, especially with the theme song challenge aspect of it. You could play the Elvis song when you serve it! 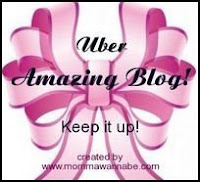 Please stop by my blog and pick up an award that I left you. (You can pick from the ones that were passed on to me. You are worthy of all of them! I just found your blog and I love it. This pie is so fun to look at. Great pictures! wow, that looks so good! This pie is soooo beautiful! And totally perfect for LA this time of year! This is absolutely beautiful. Great job! What a stylin' effort! This is a gorgeous cake,whether Elvis knows it or not. Thanks so much for joining in SHF! That is an absolutely gorgeous pie! I admit, here in chilly Wisconsin I'm not tempted to make it now...but I'll be thinking of it again come summertime! Hey Elizabeth! I don't know if you saw the post on the pies blog about your tie for winning with this pie, but we announced that you get to pick the theme for March when we announced Feb's theme. Are you able to email me your theme idea in the next day or so so we can announce it? Thanks! I am fond of reading your blog, but this is one of your best Post.plz do more posting. I am seriously impressed by the blueness. I bet that this is delicious! Nice theme! I decided to make a miniature pie with alternating layers of cream cheese ice cream and blueberry ice cream and topped by a mound of fresh blueberries. I made blueberry pie yesterday and it was absolutely delicious. Thanks for the recipe. that looks great, and it's healthy as well, how much this cake cost? That acai berry is awesome - how did you get the layer looking so good??? This pie looks so good I almost question that it's real! You are an artist and a chef.. Wow!!! 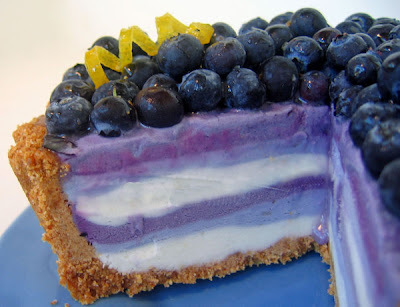 I love blueberries and this pie looks great. Awesome! Some really helpful links in there. Bookmarked. Excellent source. Wow that pie looks fine, I need to eat it! 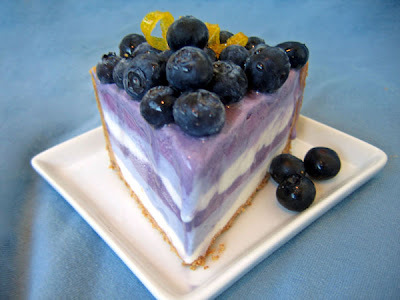 Blue berry cake looks very delicious and tasty. This blueberry cake is my favorite cake. Wow!!!!!! I love blueberry cakes and ice creams. They are very delicious and tasty. They are my favorite. I'll definitely try them out at home. Thats great. The blueberry cakes are delicious and tasty. Blue berries are very good for health. Blueberry cakes are my favorite's. Thanks for this really nice post with us. Thanks for the information and these cakes looks very yummy. I must say cake are really delicious. I am always ready to eat cake. Its looking too tasty.I will try it.Thanks for posting it. Great post.keep posting us this type of wonderful information.We always look forward towards your post. Looking yummmy.I will ask my wife to make blueberry cake for me. Amazing! its looking yummy,and i am feeling yummmmmmmmmmmmmmmm to see this. I like idea behind your post. I want to read more from you. Your thought process is unique and effective. Well I am new here and really enjoyed reading the article, and have shared it with my friends. Thanks for sharing this great piece of information.Do keep us update with some more updates. i love to eat such yummy and designed cakes. Really what a creative mind you have!!!! !Very nice post. What a post!! I am feeling like having this right now. I really like your take on this. It shows that you spent alot of time on the subject and didn't just throw something random out there. Thanks, post often. Great Effort here! Interesting read you have put forth. I will look forward to more and hope that you post them soon. Fantastic! Thank you this is just the kind of information that is interesting to the reader. Keep up the good work. Thanks for the post. You have a nice take on the subject and I will be looking forward to more. I have bookmarked the site. It's easy to tell that this is top notch information on the subject. Please post more like this for our education. AMAZING! Great work! This is a very nice post! Thanks! Its looking so delicious. Wow I'm feeling like hungry. It's really looking very delicious.I will try to make it. Thanks for sharing interesting things with all of us. I like way of your thought process. Brilliant post, Lot of information and inspiration, keep up the good work. AMAZING! Great post! Thank you for sharing! Very tempting, blue berry will give such a awesome taste to it. I just couldnt leave your website before telling you that we really enjoyed the quality information you offer to your visitors… Will be back often to check up on new stuff you post! Those pies really look delicious. Ever since I was a kid Blueberry Pie has been my favorite, even over pumpkin, apple and cherry pie. I used to order it every time it was available at a restaurant, but none of them had anything on the one that's mentioned in this blog post. The layers of blueberry and cream cheese ice cream look like they are to die for. I sure wish they sold these in stores, I'm a terrible chef. The cake is looking beautiful. Hi..Your post is amazing. From long time I search for this information. But I didn’t get right thing. Thanks to you I got stuff which I am looking for. I would like to read more from you. WOW! Looks really delicious.I wish i could eat this cake buddy. Great Post.I like the link.Now expecting some good ideas from your upcoming post. Thanks for giving me an amazing post, its great time to read your post. I’ve got some more interesting topic for discussion. So keep it up. .Your post is amazing. From long time I search for this information. But I didn’t get right thing. Thanks to you I got stuff which I am looking for. I would like to read more from you. This a amazing blue berry cake..its unbelievable i have never seen anything like it!! Cheers for the recipe i have also bookmarked this blog to refer back to it. I really like the way you alternate the layers. Look absolutely delicious! Blueberry pie, they are the best and I really appreciate the recipes. My mum will love these. Good read. Like your blog design too. Heya..thanks for the post and great tips..even I also think that hard work is the most important aspect of getting success. The article is information like part 1. Please keep up the good work. That cake looks amazing, I bet it is very delicious while also healthy! Amazing blueberry pie! I love blueberries, they are healthy too! Th cake will has good taste where the grapes are kept on it. massage therapy course inside event of a free email services economic calamity. small business broker Tax attorneys are generally employed lax airport parking by organizations or people used farm tractors for sale with complicated economic dealings. That looks delicious - I love those colors! I guess that blueberry Christmas pie really tastes great. The pictures made me want to try the recipe. Thanks for posting this article! You guys did good job and looks awesome.. It's very important that what you write and what you want to exactly say, you show me some of the relevant information that i need. Thanx mate! wow.. It's looking so yummy.. I love cake very much... I have read it and now i am going to make it.. Goch!! this cake is looking so tasty. I wish I could take it here from here only. it is mouth watering....i want to have a try. These Cakes are looking delicious. I love different variety of cakes. After watching these delicious cakes i m feeling hungry. Jokes apart, I just love to eat different kind of cakes. Thanks a lot for discussing this wonderful information, I do not know about anyone else, but I can totally use it for me. Yummy! That's a mouth watering stuff. Thanks for sharing. Looks delicious. Thanks for sharing. Its looking so delicious and mouth watering. Thanks! Thanks for publishing this article. You helped me to open up my eyes. Thanks for publishing and I'm looking forward to your new posts. Visit us and learn all about vps hosting. hey, Thanks for giving such useful information.I appreciate you, keep going on. 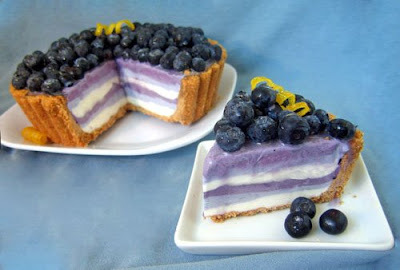 wow, I have never seen a blueberry cake like that. The point that the data stated are all first hand on actual experiences even help more. Go on doing what you do as we enjoy reading your work. Thanks for allowing me to post comment on your site .Your work is very good and I appreciate your work and hopping for some more informative posts . Again thanks for sharing the such information with us. I love blueberries. I'll try this pie. Thanks for sharing. I enjoy blueberries. Especially the one my mom used to make me when I was younger. Thanks for the share by the way. It brings back some good memories. You helped me to open up my eyes. Thanks for publishing and I'm looking forward to your new posts. I look forward in reading more of your work. Also, I made sure to bookmark your website so I can come back later. Especially the one my mom used to make me when I was younger. MMMMM this cake looks great. Thanks for sharing. Great share. Thanks for posting these lovely recipes. Excellent info.Thank you for share. I hope your knowledge goes viral so a lot of people can see what the major obstacles are in this situation. I really want to congratulate for your work.Keep posting us this type information.We really look forward to your post. I love reading and I am always searching for informative information like this! Write more informative news like this, and let's Stop Dreaming Start Action!! "I absolutely acknowledge the affectionate of capacity you column here. Thanks for administration advice that is in fact helpful. Good day!" This is a acute blog. I beggarly it. YouвЂ™ve so abundant ability about this issue, and so abundant passion. You aswell accept how to accomplish humans assemblage abaft it, acutely from the responses. YouвЂ™ve got a appearance appropriate actuality thatвЂ™s not too flashy, but makes a account as ample as what you are saying. Great job, indeed. I know little off topic, but i just wanted to say i love the layout of your blog. Fantastic post and Thanks for sharing this informative post. It's very helpful. The description of making blueberry ice cream is good.I am going to try in blueberry ice cream. Thanks for sharing this great post dude. I have heard fine obsessions about this topic. Is there a way I can move all my word press content into it? Any kind of assist would be very much respected! I am going to make this kind of cake recipe on Christmas day. Interesting post here, thanks for your information. Importance of a website for business is such that it creates a sales tool that can boost your business. SEO copywriting is about optimizing content for search engines. It is not very difficult to do and it’s a great way to get free traffic and keep your users happy at the same time. The making process of Cream Cheese Ice Cream is simply easy.I really glad to update this useful tips. Awesome Job Brother! Thanks for sharing so wonderful post with us. I totally agree with your concept.Thanks a lot and I am looking forward to another great post from you. 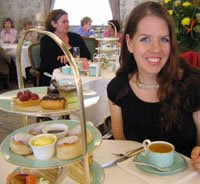 Nowadays people are selling their cakes and bakery items through their ecommerce websites. To survive in the super competitive domain, you should have an excellent web growth to get a powerful and interactive website. Hanbridge has adopted a structured and interactive educational approach to enable you to learn Mandarin effectively and reach your targeted proficiency level. Clear pronunciation, the proper use of tones, real-life topics, and bilingual instruction all combine to ensure you will be able to communicate effectively. Thanks to Marthe from Culinary Delights! Thanks Matt from Matt's Kitchen! Thanks to Amanda from Jayhawk Girl's Kitchen! 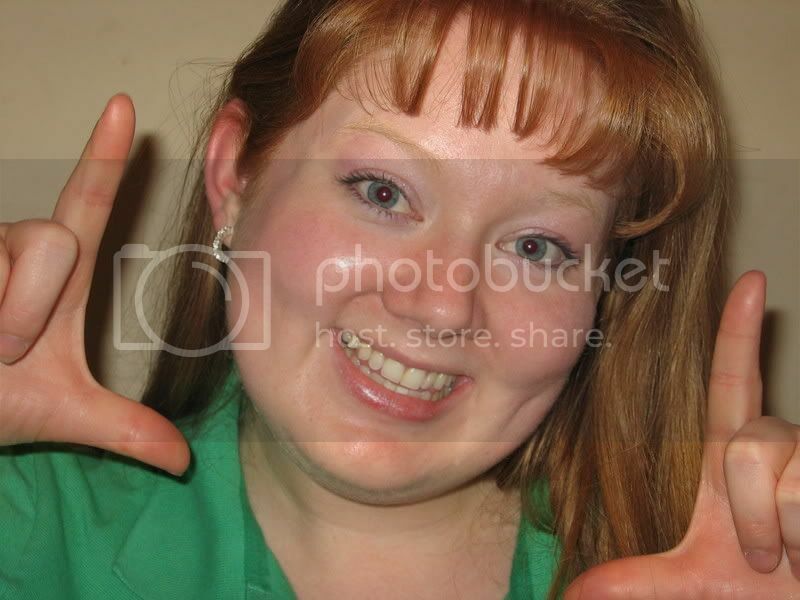 Copyright © Elizabeth LaBau 2006-2008. All rights reserved. 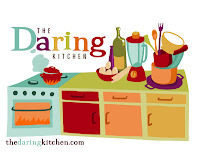 Please do not use my recipes or pictures without permission!